For other uses, see Loam (disambiguation). Three layers of subsurface loam; surface layer is dark brown fine sandy loam, subsurface layer is pale brown fine sandy loam, subsoil is red clay loam and sandy clay loam. Loam is soil composed mostly of sand (particle size > 63 µm), silt (particle size > 2 µm), and a smaller amount of clay (particle size < 2 µm). By weight, its mineral composition is about 40–40–20% concentration of sand-silt-clay, respectively. These proportions can vary to a degree, however, and result in different types of loam soils: sandy loam, silty loam, clay loam, sandy clay loam, silty clay loam, and loam. In the USDA textural classification triangle, the only soil that is not predominantly sand, silt, or clay is called "loam". Loam soils generally contain more nutrients, moisture, and humus than sandy soils, have better drainage and infiltration of water and air than silt and clay-rich soils, and are easier to till than clay soils. The different types of loam soils each have slightly different characteristics, with some draining liquids more efficiently than others. The soil's texture, especially its ability to retain nutrients and water are crucial. Loam soil is suitable for growing most plant varieties. Bricks made of loam, mud, sand, and water, with an added binding material such as rice husks or straw, have been used in construction since ancient times. Loam is found in a majority of successful farms in regions around the world known for their fertile land. Loam soil feels soft and crumbly and is easy to work over a wide range of moisture conditions. 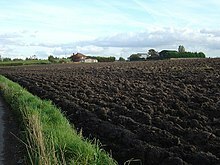 Loam may be used for the construction of houses, for example in loam post and beam construction. Building crews can build a layer of loam on the inside of walls, which can help to control air humidity. Loam, combined with straw, can be used as a rough construction material to build walls. This is one of the oldest technologies for house construction in the world. Within this there are two broad methods: the use of rammed earth, or unfired bricks (adobe). ^ a b Kaufmann, Robert K.; Cutler J. Cleveland (2008). Environmental Science. McGraw-Hill. pp. 318–319. ISBN 978-0-07-298429-3. ^ R. B. Brown (September 2007). "Soil Texture" (PDF). Agronomy Fact Sheet Series: Fact Sheet SL-29. Cornell University, Department of Crop and Soil Sciences. Retrieved May 2, 2017. ^ B. Rosie Lerner, "What is Loam? ", Purdue University Consumer Horticulture, 6 January 2000. Retrieved 5 March 2017. Wikimedia Commons has media related to Loam.